Fifth installment in our Hang video series: Florent Ghys. 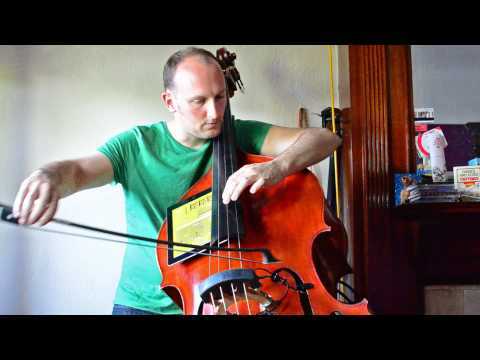 Florent Ghys is a composer and upright bass player from Bordeaux, France. He studied ethno-musicology with a focus on Arabic contemporary music in Université de Bordeaux 3, and classical contrabass in Paris with Thierry Barbé. He is currently a graduate student at New York University, studying composition with Julia Wolfe. WNYC’s John Schaefer recently said about Florent Ghys that he “creates a kind of post-minimalist chamber music using unusual phasing and overdubbing.” Florent received us in his Bed-Stuy apartment in Brooklyn and performed Nappe Brodée. Click on CC to toggle English subtitles. Subtitles can also be translated (Beta). Florent’s new ensemble Bonjour is having its debut concert on May 26, as part of Kathleen Supove’s Music with a View at the Flea Theater in Tribeca. And it’s free. And you should go. Embedding is cool. Crediting is really cool.